Further details found on our 2019 Wild Game Dinner Poster. Update: As of March 26 we have 1 table or 8 seats available. This event if filling up fast, don’t wait – contact us today! 18 Bee Blocks were constructed with 13 of Niagara College’s Beekeeping Program Students. Hawkwatch held at Beamer Memorial Conservation Area. Although the turn out wasn’t as big as last year, there were some great displays and groups in attendance. Always great to see and chat to the many local nature groups, organizations, and citizens that came out. A Bald Eagle was even seen flying over the Park near the end of the event! Earth Day continued to be celebrated with a Pollinator Planting lead by Friends of Malcolmson Eco-Park, St.Catharines. Land Care Niagara was a partner in the planting of native wildflowers in their grassland project. LCN and Friends of Walkers Creek hosted a Earth Day Tree Planting event with the help of City of St.Catharines to plant 10 native trees in Realty Park, St.Catharines. Two local schools, Governor Simcoe and Our Lady Fatima, joined us with attendance from councillors, Sandie Bellows and Mike Britton. With help from City of Niagara Falls Staff, Rotary International, Niagara Peninsula Energy and Niagara Falls schools in attendance, 40 native trees (from Land Care Niagara’s Re-Leaf nursery) were planted along Fernwood Trail in celebration of Arbor Day. This event was hosted by the City of Niagara Falls who partnered with The Park in the City Committee. This was the final day to Niagara Envirothon where the students all get tested on what they learned. Friendly competition scores announce which team will compete in the Provincial Envirothon challenge. This year the team that went to the Provincials for the third year in a row was Sir Winston Churchill Secondary. Earth Day Pollinator Planting Day 2 lead by Friends of Malcolmson Eco-Park, St.Catharines. Any of the remaining material that was not planted on day one found a home in the ground in the parks grassland area. The vegetation from the first planting to this second planting in the area had already started to emerge from its winter slumber. Land Care Niagara was excited to lead a station at the Niagara Children’s Water Festival, run by the Niagara Region, again this year. The station we lead for the second year in a row was “Simply Tremendous” , which saw over 300 students from 12 different schools ranging from grades 3 to grade 5. Students visiting the station were able to experience first hand the importance of the Carolinian forest and the role they play in the water cycle. The Greater Niagara Boating Club, located in Chippawa, allowed LCN to set up a booth at their Adult & Youth Fishing Derby this year. LCN spoke with kids and adults about the American Water Willow, invasive plant and fish species, and native fish in our waterways. Great targetted outreach at this event! LCN had partnered with OMNRF Interns at the Ridgeway Summer Festival to host a booth for the education and outreach of the Fowlers Toad. It was a great opportunity to reach out to talk about this species at risk which calls the unique habitat along Lake Erie home. Juliana and Olivia presented on Species at Risk Trees and the more rare trees that are found in Niagara. If your looking for a special guest to talk about the area and the stewardship work done in the area please don’t hesitate to contact us for your event. LCN attended the Kid’s Day Fishing Derby held by the St Catharines Game and Fish Association. We were happy to supply rental life jackets and fishing rods to the event, along with outreach material on aquatic invasive species and native fish varieties. Many participants really enjoyed the fish identification post cards and invasive carp colouring sheets! We also had posters on reptiles and amphibians found in Ontario which gave interested participants the opportunity to share their stories with us. This fair is attended by multiple elementary and high schools from the Wainfleet area. We partnered with Niagara Restoration Council again this year for this event. 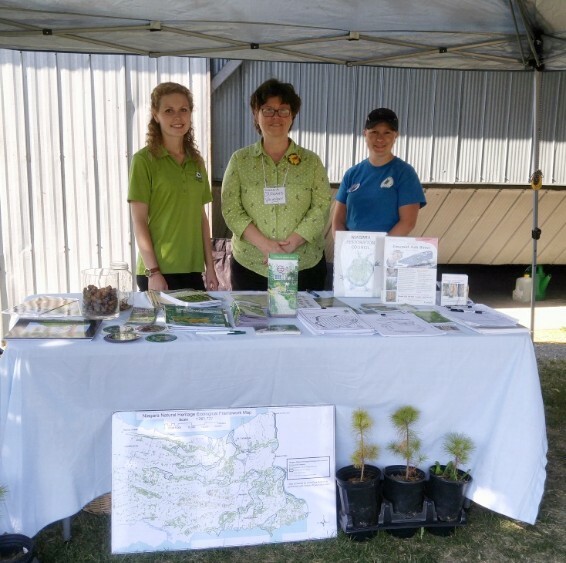 The booth this year was focusing on promoting our tree planting program, and education on species at risk in the Niagara Region; SAR trees and the Monarch Butterfly. LCN provided take away gifts of native seed packages for pollinators and butterflies, a great addition to any garden. This event saw young 4H’ers learning to plow to the experienced farmers using their own tractor to plow a field in West Lincoln. LCN attended to promote our rural tree program, the benefits of windbreaks to farmers and grassland bird that commonly use farm fields. Our LCN mascot, Joad the Toad, attended Heartland Forest’s Pumpkin Festival again this year.